Eritrean Su-27 was photographed in Ukraine, 2003. Noticeable is Ukrainian "splinter" style of camouflage with false canopy underside. Camouflage on drawing is correct. In 90's war with Ethiopia. 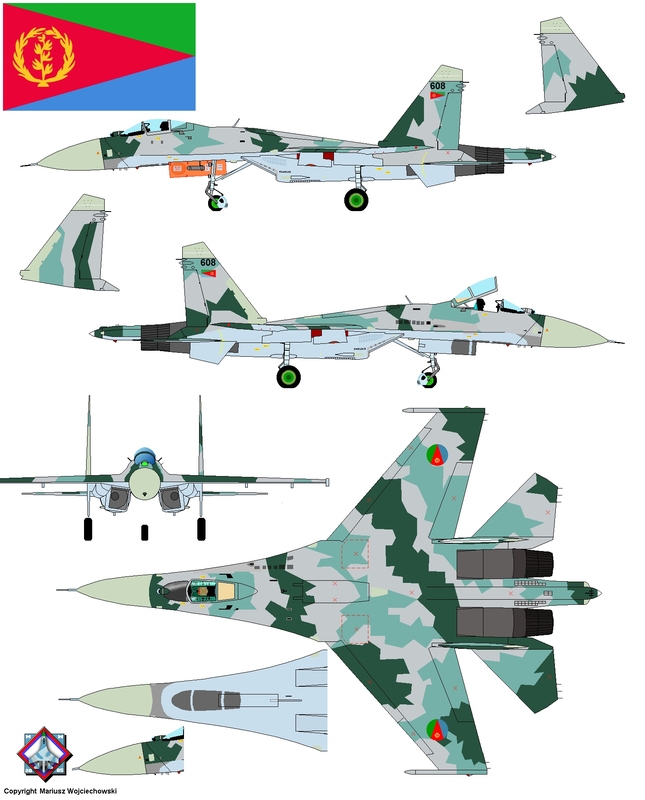 Eritrean MiGs (achieved in 1998) fight with Ethiopian Su-27. When some (2-5) MiGs was shot-down, in 2003 Eritrea bought two second-hand Su-27S and Su-27UB in Ukraine to replace mentioned losts MiGs-29. Note that Sukhois was basic variants (Su-27S and Su-27UB), not Su-27SK or Su-27UBK, because Ukraine never has such airplanes.